1. The promoter is: CHI Limited whose registered office is at 14, Chivita Avenue, Ajao Estate, Lagos. 2. Employees of CHI Limited or their family members or anyone else connected in any way with the competition or helping to set up the competition shall not be permitted to enter the competition. 5. No entry will be accepted if it reaches us on or after the day/time of completion of the competition. 6. There would be weekly posts about the week’s Manchester United Matches. Valid entries would be Predictions made as comments to this weekly post. 7. Weekly posts would be made on the page before every game and prediction ends 15mins before the game starts. 13. The promoter will only contact the approved entries from its posts. Any entry that seem inappropriate, below standard or that go against the rules of the competition will not be posted to the Facebook timeline. 14. Winners will be chosen at the end of every match. 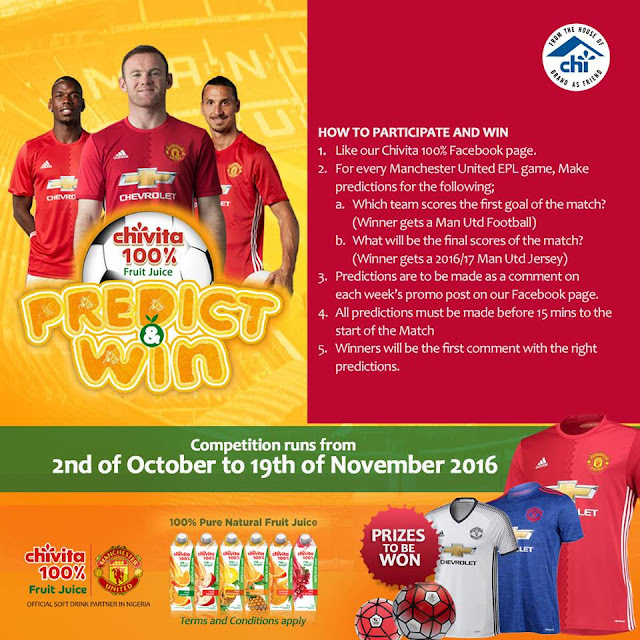 The first entry with the right prediction on who wins the match wins a Manchester United Jersey. The first entry with the right prediction on which team scores the first goal with a Manchester United Football. 15. Weekly winners are not permitted to participate in the subsequent weeks’ predictions, so as to give others an opportunity to win. 16. Winners will be notified by direct message/email within 7 days of the announcement date. If the winners cannot be contacted or do not claim the prize within 14 days of notification, we reserve the right to withdraw the prize from the winner and pick a replacement winner. 20. The competition and these terms and conditions will be governed by Nigerian law and any disputes will be subject to the exclusive jurisdiction of the courts of Nigeria. 21. The winners agree to the use of his/her name and image in any publicity material. Any personal data relating to the winner or any other entrants will not be disclosed to a third party without the entrant’s prior consent. 22. Only Nigerian citizens and people resident in Nigeria are eligible to play. Contestants must be 13 years and above to play. 24. This promotion is in no way sponsored, endorsed or administered by, or associated with, Facebook, Twitter or any other social network.